Very recently a couple of us from the office attended a retirement income planning seminar. The seminar was titled, “Don’t Live a Just in Case Retirement.” The presenter was Tom Hegna, an internationally renowned expert on retirement planning. The seminar concepts were helpful and timely. Many points were reminders, but a couple of points struck a chord with me and are worth discussing. One key point was this: “The success of your retirement is really not about assets.” Well, that’s controversial. Isn’t retirement about having a certain number? (i.e. How much do you have in your retirement nest egg?) Assets are lost, stolen, divorced, etc. His argument was that the success of your retirement really depends upon how much guaranteed, lifetime retirement income you have. His argument is not just based on emotion, but research. But what’s the problem? There are fewer and fewer companies offering the pensions of one to two generations ago. It’s too costly and risky for employers. Therefore, we see defined contribution plans more today, such as 401ks, 403bs, and deferred compensation. The risk has been transferred from the employers to the employees. The employees are in charge and responsible for saving enough for retirement. Problem is, how much is enough? Is it a certain number? We’ve dispelled that myth before. There’s no magic number that works for every person. Each person and financial plan are unique. What’s the good news? We firmly believe a joyful, content retirement is possible, but it must come with a plan. The second and last point that struck home with me was this: “How will you avoid risks detrimental to your plan?” Great question. Ignoring current and future risks is not wise. They need to be addressed. What are some of those risks? The purpose of this writing is not to invoke panic and hysteria. Really, it’s not. I do, however, hope the items discussed moves you to taking action. “Any plan is better than no plan!”, said Tom. “Look at the birds of the air: they neither sow nor reap nor gather into barns, and yet your heavenly Father feeds them. Are you not of more value than they? 27 And which of you by being anxious can add a single hour to his span of life? [a] 28 And why are you anxious about clothing? Consider the lilies of the field, how they grow: they neither toil nor spin,29 yet I tell you, even Solomon in all his glory was not arrayed like one of these. 30 But if God so clothes the grass of the field, which today is alive and tomorrow is thrown into the oven, will he not much more clothe you, O you of little faith? 31 Therefore do not be anxious, saying, ‘What shall we eat?’ or ‘What shall we drink?’ or ‘What shall we wear?’ 32 For the Gentiles seek after all these things, and your heavenly Father knows that you need them all. 33 But seek first the kingdom of God and his righteousness, and all these things will be added to you. Living in the “already but not yet” is not easy. We know the ultimate battle has been won. We also know that on this side of eternity, the struggle and fight is real. Brokenness, hurt, loss and pain do exist. So how are we to respond? We trust. We follow. We love. We ask for help and forgiveness. And, we don’t give up. Ask us for help. We’d love to walk alongside you through this journey of life. It’s not just about money for us. It’s a much bigger conversation. Scott is the founder and a partner at Rivertree Financial Planning. Scott and his wife Helen currently reside in Jackson, MS with their three children Artur, Taylor, and Molly. They are members of Redeemer Church, PCA in Jackson. Have you ever assembled a piece of equipment, or perhaps a toy for a child, stepped back and admired your great handiwork, only to find a part (or two) leftover which should have been used? On the outside, your masterpiece looks flawless. On the inside, however, you’re wondering just how important those pieces are. That “gap” could be the most important pieces. 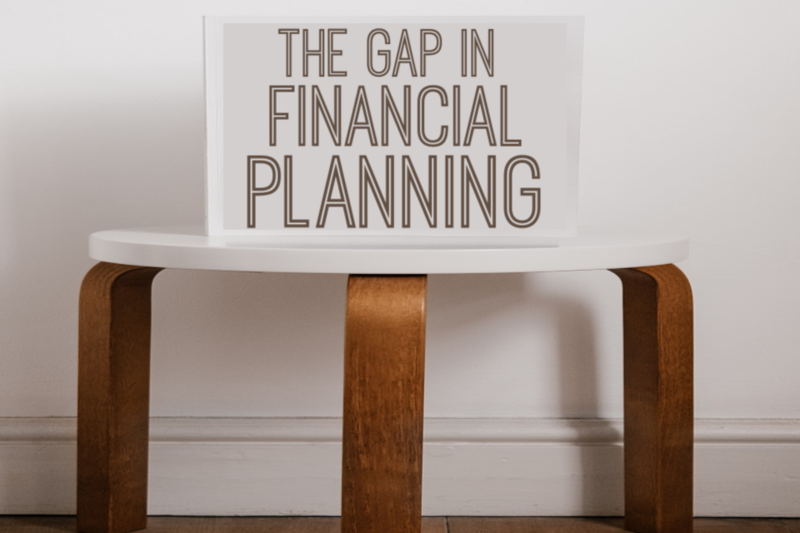 When it comes to financial planning, there is an area we most often see as the “gap” after 35+ years of us working with clients. The “gap” is this: What happens to you and your family in the event of an unexpected death or disability? We can plan for your investments, savings, insurances, budget and retirement. And all of that is good. But what happens to your minor children in the event you pass away prematurely? I know…not a fun read for today. But, it happens, and we all need to have a plan in place for what we desire to occur when, not if, we pass away. What I am talking about here is an estate plan. 2) My family will just cordially work out who cares for our minor children. False. More often than not, a judge listening to both sides of the family makes the best decision that he or she can. Whew! How much easier this would have been with simple wills declaring his or her wishes for who should care for the children. 3) The courts will just work out what is fair for everyone involved. False. What is considered “fair” is relative to those involved. Did you know that in many states, Mississippi being one, a spouse receives the same percentage share of an asset as a child would should the deceased die without a will and the asset had no named beneficiary? These are just a few myths that come to mind. Over the years, we have seen the heartache involved when a person’s estate is not planned well, or at all. They may have sufficient assets to care for loved ones. However, without a properly designed estate plan, disaster can occur, causing stress for loved ones. We often get asked: “Should I pay an attorney to help, or could I write my own will?” Well, “yes and yes.” You should pay an attorney, and you can write your own will. However, we believe it is much wiser to get professional help, especially should a problem arise down the road. You can attempt to diagnose that continual headache, rash or stomach pain all day long using webmd.com. Or, you can pay a doctor who does this type of work on a daily basis. That stool could have a fourth leg for situations needing a Revocable Living Trust. We won’t go into detail on any of these today, but it’s worth bringing up each of these items to the attorney you choose. I have observed that the hardest step is the first step – not just in estate planning, but in many important areas of life: Making that first phone call and asking for help. I am a big believer in professional help. That includes the work we do as financial planners. All your ducks may be in a row, but it’s worthwhile to have a second set of eyes to make sure. We think you’ll be glad you did. 1) Donating low tax-basis capital assets, such as stocks or mutual funds: How does this work? Generally, when you sell a capital asset, you have to pay taxes on any gains. For example, if you bought 400 shares of a stock (or a mutual fund) at $25, held them for at least one year, then sold them at $30 per share, you would owe taxes on the $5 gain per share (400 shares x $5 gain per share = $2,000 in taxable gain). Using this example, let’s say you planned to give $12,000 to charitable organizations. Normally, you would just write a check from your checking or savings. However, by donating the stocks at fair market value of $12,000, you get the same tax deduction AND avoid paying capital gains tax. For the charity, it’s the same amount of money. But for you, it’s less taxes. 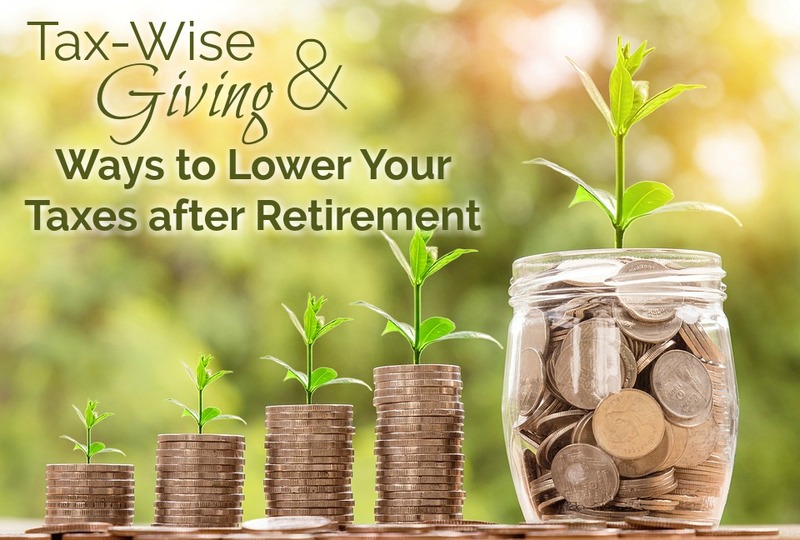 2) Donating your Required Minimum Distribution (RMD): When you turn age 70 ½, the tax code requires that you begin taking minimum distributions from your pre-tax retirement accounts (Possible exception: 401k plan while still employed). Why can this be a problem? Well, one, you may not need or want the additional funds. And two, these distributions are direct increases to your taxable income. Rather than receiving these distributions, the tax code allows us to donate up to $100,000 as a “qualified charitable distribution (QCD).” For the receiving charity, they receive the same amount. But for you the taxpayer, your taxable income is reduced by the amount donated. 3) Reducing your living expenses: How does this help? Well, in two major ways. First of all, living on less means you’re taking out less from your retirement accounts. That strategy is a direct reduction of your taxable income and reduces the chance of paying taxes in a higher marginal bracket on a portion of your income. *What’s a sure-fire way to reduce your living expenses in retirement? Being debt-free! 4) Fund Roth 401k’s and Roth IRAs: This strategy particularly applies to our “Accumulator” folks. Why? You have more time to fund retirement accounts that do not require minimum distributions beginning at age 70 ½. Often, we have clients who do not want to take their required minimum distribution but are forced to, increasing their taxable income. These are just a few ways to lower your tax liability in retirement and give in a more tax-wise manner. If we can be of assistance in any way, please don’t hesitate to contact us. We’d love to help. Disclosure: Be sure to discuss these strategies with your CPA or tax preparer as each individual’s tax circumstances are unique. These planning strategies are not considered “tax advice” but merely strategies to consider. To prepare for this writing, I just spent about 30 minutes updating my personal retirement and education savings plan. All the basic facts were there — it just needed some minor tweaking. As a nerd, it’s fun to track progress towards meeting our goals. But, being married to a sweet lady who defines “fun” differently from me, I understand we are all wired differently. Maybe you or someone you know would like to start planning for retirement, but they don’t know where to start. Whether you’re a nerd or a free spirit, here are three things you can do to start planning for retirement. There’s no way around organizing what you have. For many, this step is the greatest fear. Why? It’s a reality check. Start with your most recent bank statements and other account statements. Soon to follow would be your tax return and other financial records. We have a one-page checklist that’s extremely helpful. Let us know if you would like to receive it. No, it’s not the balance of your overall retirement nest egg. I’m talking about the number it takes you to live each month. We have to use certain assumptions when developing retirement plans, such as inflation, rates of return, monthly savings, etc. But we would argue no assumption impacts the success of your plan more than minimizing this number. How do you reduce it? Have a plan to be totally debt-free when you reach your retirement age. We can help. I know…but what about online retirement estimators? Sure. You can try it. But know that all aspects needed to develop a sufficient retirement plan are rarely included in these tools. For example, does the online calculator factor in social security maximization strategies, tax-efficient withdrawals strategies, realistic growth rates, etc. You may enjoy managing your own investments and do well with it. So maybe you need a fee-based financial plan to make sure you’re not missing any critical pieces to your plan. I often say that there is only one guarantee when presenting a retirement plan: It won’t look exactly this way. Life happens, and goals can change. So then why plan? Managed money goes farther….period. As the late Zig Ziglar said, “If you aim at nothing, you’ll hit it every time!” Let’s aim at something. You might be surprised. Schedule a call today so we can help you plan for tomorrow. Sign up to receive these blog entries in your inbox.